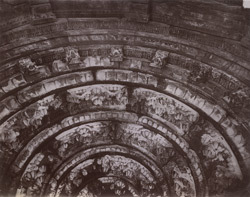 Photograph of the sculptural details of the domed roof of the Mahanaleshvara Temple at Menal, taken by Joseph David Beglar in the 1870s. At Menal there are many Hindu temples built on the edge of a gorge with a waterfall, the oldest dating from the 9th century, Pratihara period. The Mahanaleshvara Temple is the most important of the temples at this site. It dates back to the 11th Century, Chahamana period. The tower over the sanctuary has tiers of miniature temple towers and meshed bands in the middle, typical of central Indian architecture and is crowned by a large amalaka. The outer walls are decorated with panels carved with guardian deities and Shaiva figures. The decoration of the domed roof consists of concentric circles with pendant lotus buds.